JUST SOLD! Largo, Florida home sold after 4 days on the market! 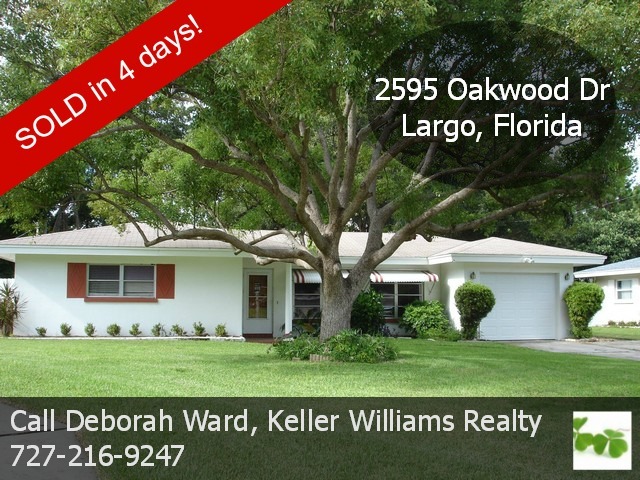 Deborah Ward & Associates, Keller Williams Realty, just sold a 2 bedroom 1.5 bath single family home at 2595 Oakwood Drive, Largo, Florida for the full asking price of $125,000. This home is located in the Keene Forest subdivision conveniently located near Keene and East Bay Drive. It’s secluded on a quiet side street with a neighborhood park complete with a small playground surrounded by majestic oak trees, and a pond with many ducks in residence! The buyer’s new home has a wood burning fireplace in the living room, a large family room, and a screened porch overlooking the huge backyard. There is plenty of room for a pool and parking for a boat or RV. Due to the low inventory of homes for sale in the area, lucky for the buyer he acted quickly and decisively to secure his new home. The seller had been considering moving out of state to live near family, but it was when she received a last minute opportunity to begin an educational program out of the area, it became very important that she sell her home quickly. A friend of hers recommended Deborah Ward & Associates to help her sell her house, since she was so happy with the service she had received when buying her Clearwater home earlier in the year. Deborah Ward consulted with the seller to price her home to sell quick, and 4 days after listing it, the seller accepted a full price offer! Call us at 727-216-9247 for all your real estate needs!